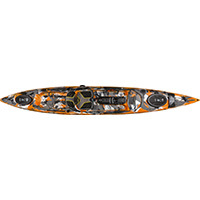 The Ocean Kayak Trident 15 Angler offers paddlers great stability and weight capacity. Featuring the exceptionally comfortable ACS2 seat, hinged Mod Pod, six accessory tracks, and an accessory plate with a transducer compatible scupper hole, the new Ocean Kayak Trident 15 is fast, efficient, and comfortable. We are a brick and mortar store, and we’re open five days a week. Typically, we have the majority of the boats and boards that you’ll find on our website also on display in our store. We encourage you to stop by and see in person the model that you’re interested in. There’s nothing like sitting in a boat, standing on a board, and seeing and touching it before you buy. Call us at 707-766-8070 to set up a demo.